MSF constructed a special Ebola treatment centre here in Kailahun that opened at the end of June and is now almost full. Across Guinea, Sierra Leone and Liberia, this is where MSF has been seeing the biggest number of cases to date. There are villages that have lost the majority of their adults to the disease. The people in this area are scared of the Ebola virus, but there are no signs of uncontrolled panic. Confidence is not in short supply. People speak of their belief that they can control this outbreak with the help of international organisations. The scenes, however, can be heartbreaking. In the suspected cases ward I saw a small child getting his nappy changed by a nurse who was wearing a full body plastic protective suit. The child was clinging on to the nurse, searching and hoping for comfort in a place which does not allow direct skin-to-skin contact. As a father myself, this image stuck in my mind. On the same evening, a mother and her two children were admitted to the hospital with confirmed Ebola. Within days the mother and eldest child had passed away. It is startling how quickly this virus can kill patients. The remaining child is still receiving supportive care but his chances are not good. Media captionEbola doctor Gabriel Fitzpatrick tells BBC 5 live: "We wouldn't be human if we weren't worrying"
There are a few rules in the Ebola treatment centre that are sometimes difficult to remember and go against our natural instincts. Firstly, shaking hands with anybody is forbidden, and you must keep a certain distance away from people at all times. This can feel isolating. It is also immediately noticeable that staff do not touch their faces with their hands. This is because the virus is spread through contaminated fluids. If you have the virus on your hands and then touch your face or mouth you could develop Ebola. Sierra Leone has 2.2 doctors for every 100,000 people (2012 figures). Guinea has 10 (2005) and Liberia just 1.4 (2008), both far behind the UK (279) and Switzerland (394). Resources in Sierra Leone and Liberia are drained by malaria treatment. Both had some 1.5 million confirmed and probable cases in 2012, from overall populations of about 6 million and 4 million respectively. Sierra Leone and Liberia have suffered economically due to civil war. Sierra Leone emerged from a decade of conflict in 2002, while long-running hostilities in Liberia ended the following year. 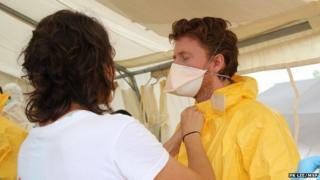 One day an ambulance arrived at the Ebola triage tent. I peered in to make an initial assessment, being careful not to get too close. A young man was lying dead in the back. He was curled up in the corner. I could guess his final moments had not been peaceful. No more than a few metres away, within the confirmed cases ward, a child was playing on the ground with a doll. The division between the worlds of life and death are sometimes difficult to distinguish in this place. There are happier stories - some of those who catch Ebola survive. For some unknown reason their bodies beat the virus. More than 300 patients have been admitted to MSF isolation centres in Sierra Leone. To date about 50 have recovered and returned home. Every few days, patients who have survived are discharged from the hospital. This is a big occasion and is celebrated both by those who have recovered and by hospital staff. Certificates are presented to these patients during a ceremony with somebody invariably performing a dance. West African music is supplied via a mobile phone. Working at the heart of the largest Ebola outbreak ever recorded is tense for all healthcare staff. The ever-present danger of making a mistake and infecting yourself or others is very real. Doctors and nurses from Sierra Leone have died on the front line of this expanding battle. People working here deal with this stress in different ways. I personally deal with it by hearing my wife's voice over a crackling mobile phone when I get a chance to call her. I have a picture of her and my son on me at all times. As part of my role here I also work as a medical epidemiologist. This essentially involves investigating cases to try and find out where and how the patient initially contracted Ebola. Earlier this week I travelled to a small village about one hour's drive from Kailahun where a number of cases have been reported. The village consists of about 10 houses around a central square. The village chief told me that two families had been almost wiped out by the virus during the last week of July and this had caused great fear among the inhabitants. The first person to develop the illness in the village hunted "bushmeat" in the surrounding jungle and used to sell it to his neighbours, including those families affected by the virus. Since then, health promotion teams from both MSF and the World Health Organization (WHO) have visited the village providing education and advice about Ebola. This has somewhat alleviated the villagers' concern, but not fully. When a small village suddenly loses two families to an unknown virus it can take a long time to recover. The current Ebola outbreak can be stopped if the infected patients are found and isolated, and if comprehensive contact tracing and health promotion are carried out in the community. All this takes resources - more doctors, nurses, epidemiologists, water and sanitation specialists - which are in short supply at the moment. In the meantime the fight against Ebola continues and I feel the people of Sierra Leone are more than up to the challenge - if they get sufficient support.